This review was originally supposed to be a ‘first impressions’, but against my better nature I have become a bit addicted to this game…so here is a full review! Middle-Earth: Shadow of Mordor is an amalgamation of Assassin’s Creed, Batman: Arkham and, of course, the Lord of the Rings universe. Now, I love all of these series, so was super hyped for this game. My verdict after playing it for a good ten hours completing it? Ehhh….very good, but not amazing. Don’t get me wrong, I very much enjoyed my time playing Shadow of Mordor, and it’s mighty addictive, but there are many things that this game promised on, or should incorporate, that it just doesn’t. Let’s start with the plot. The game is set somewhat ambiguously between the events of The Hobbit and The Lord of the Rings. However, it is unclear whether the events of Shadow of Mordor are canon or not, for a handful or reasons, generally to be with lore laws and time frames. This is just Tolkien nerd stuff, and isn’t really important, but when you kind of know the outcome (the events of Lord of the Rings) then you probably won’t get that excited as to what the outcome of the story is. Whilst the game does do a great job of making you feel like you’re in Middle-Earth, there are a few aspects that I imagine would make young J.R.R turn in his grave and huff – a few very un-Tolkien-y aspects. But then, this is the man who one day decided that he had been spelling ‘orc’ wrong and decided to stick a ‘k’ at the end instead. Truly a genius, was he. Anyway, on to the plot. Protagonist Talion – a ranger stationed on the Black Gate – and his family are brutally murdered when Sauron’s (who is in the midst of leaving rehab) forces attack. 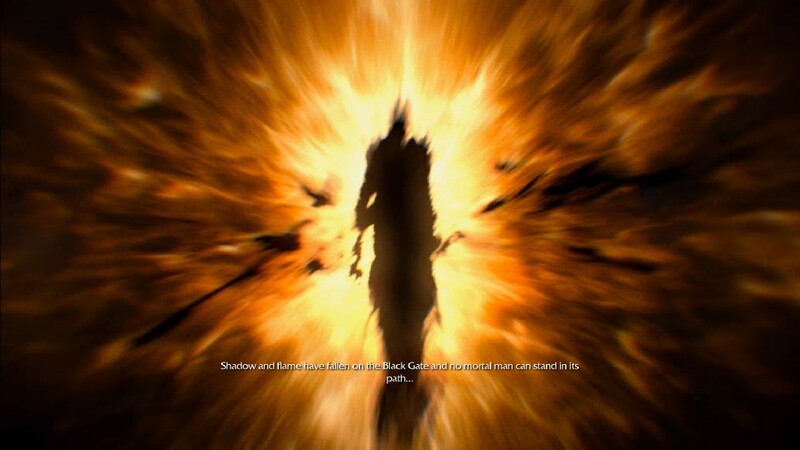 However, something strange happens to Talion, and he awakens to find himself only mostly dead. He is revived by an enigmatic elf-wraith who seems to only speak in riddles, metaphors, proverbs and LotR quotes. The overall story itself is ok, but nothing amazing. 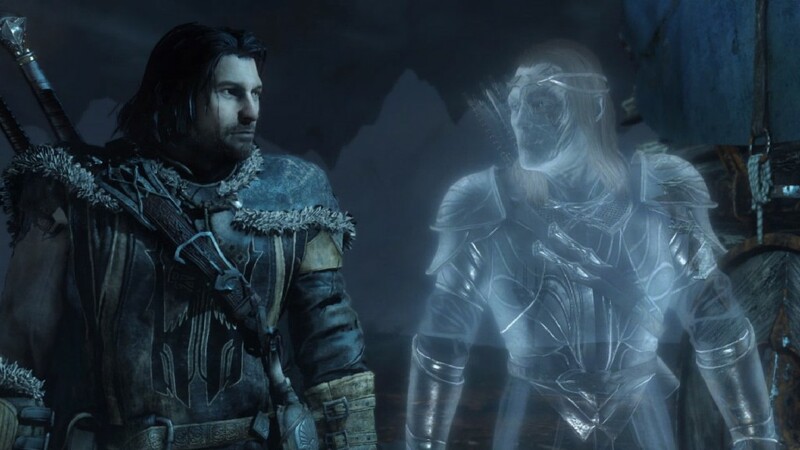 It’s almost told in two parts – the present day exploits of Talion – who I was extremely apathetic towads – and uncovering the history and true identity of the Wraith. The latter is certainly most interesting, as it also reveals more on the origins of the One Ring…plus, you get the help of a certain skinny, balding ex-hobbit. Talion’s present day shenanigans aren’t particularly exciting and follow quite a basic, conventional structure, complete with a forced semi-love interest because she is the only other female in the game under 50. The final couple of missions are quite good, but are let down by easy boss fights and an overall disappointing ending that almost screams “lol wait for DLC”. Still, there are plenty of other things to keep you occupied whilst playing through Shadow of Mordor, so the disappointing story isn’t that much of a hindrance. The game essentially has you playing as two characters – Talion and the Wraith. 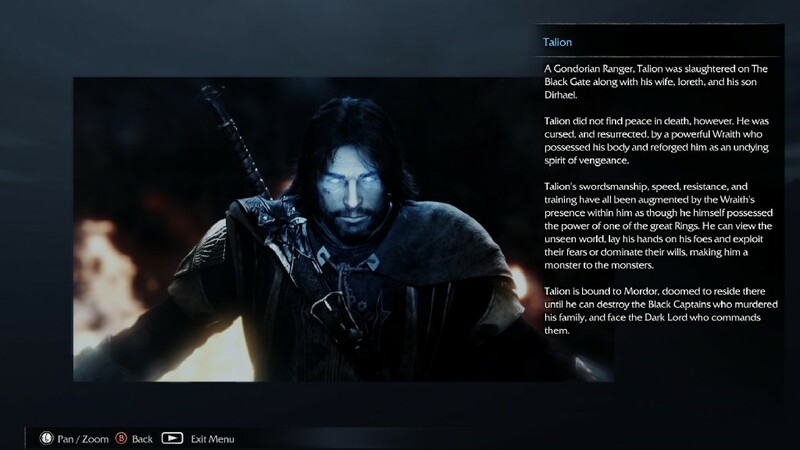 Talion can utilise the standard ranger skills of swinging a sword, whilst the Wraith enables him to perform wicked cool combos, shoot a ghostly bow, jump and climb almost Assassin’s Creed style, scare enemies, gaze into their minds and even control them later on in the game. Killing enemies and completing tasks grants experience which in turn unlocks more combos and moves. The combat system is pretty much Batman: Arkham, but with swords and uruks (which is another word for the type of orcs you encounter) instead of batarangs and fists, so if you’re familiar with that then you know what I’m talking about: keep mashing the attack button to build up a combo, occasionally countering when the indicator appears above enemy heads, or dodging, or stunning to unleash a bigger combo with the occasional instant takedown thrown in…which is awesomely satisfying. I don’t really think I need to explain it any more. 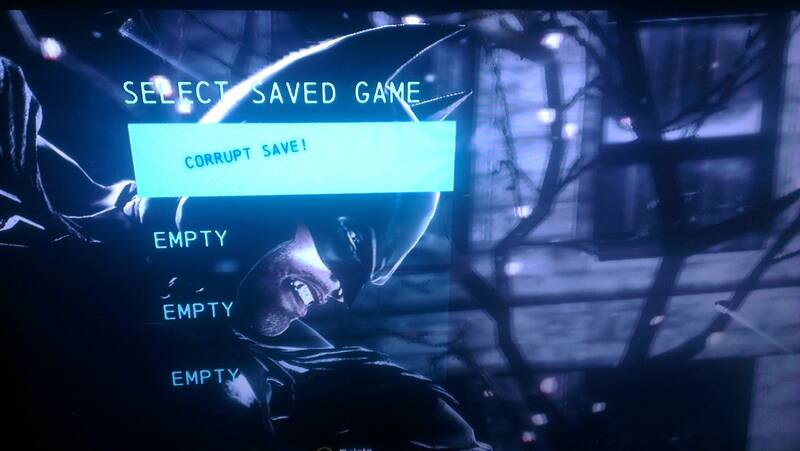 It is literally Batman: Arkham. 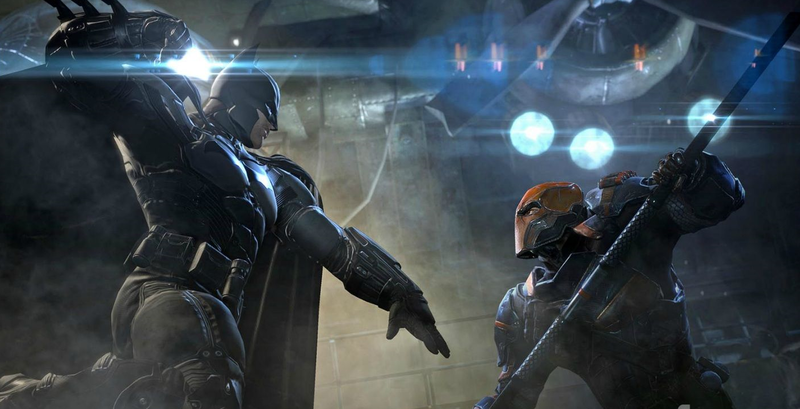 This isn’t a criticism, as the combat in the Arkham games flows very nicely and is rather enjoyable, and it has translated over to Shadow of Mordor very well. There are a few issues with Talion attacking a completely different enemy than I wanted him to, but it’s not that big a deal. Unlocks include finishers, throwing knives and bow attacks that aim to keep combat fresh and entertaining and allow you to build up super cool combos. Combat is a lot of fun. 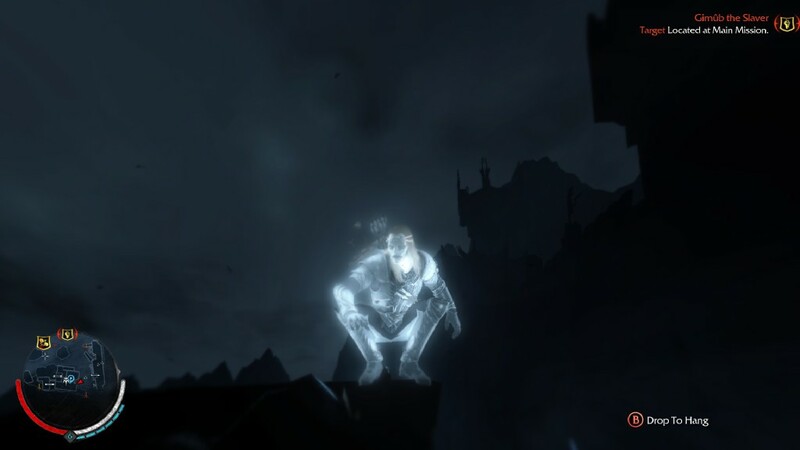 If you don’t want to get up close and personal, Shadow of Mordor also includes a pretty good stealth system too. Using his dagger, Talion can sneak up and assassinate unaware enemies, before retreating back to the shadows or a conveniently placed bush. The bow also introduces a new pace of combat, allowing you to snipe enemies from a far and, later on in the game, blink towards and execute them, which has become my favourite thing. The combat itself isn’t particularly tricky – even bosses don’t pose much of a challenge, sadly – unless you suddenly get ambushed by about 50-odd orcs…which tends to happen quite a lot. But even then, if you have your wits about you and know how the flow of combat works, you can time counters and dodges so that you don’t get hit at all. But even if you do, dying is kind of fun so it’s not a big loss. Outside of combat, AI is…pretty stupid. Uruks seem to have a peripheral vision of about 100˚, so you can stealth kill one fella, and the guy next to him won’t notice. To my knowledge, there is no option to crank up the difficulty, which is a shame – though removing certain features from the HUD will make it harder to see when to counter in combat, I guess. But it doesn’t take long in the game before you’re able to take down bosses in about 5 hits or so. Exploring Mordor, you’ll be running around Mordor like a rampant mûmak in a mithril shop. Similar to Assassin’s Creed, you can climb up buildings and parkour across rooftops to drop down on oblivious orcs. In fact, this whole element seems to have been lifted from Assassin’s Creed completely, right down to the way Talion moves or leaps off a building. Like, it looks literally the same. Due to the clunky controls however (also maybe lifted from Assassin’s Creed, but a bit worse) you’ll oft find yourself jumping the wrong way, or plummeting to the ground when you meant to grab a ledge. You’ll get used to the controls eventually, but my god it feels like Talion ways as much as…a rampant mûmak in a mithril shop. Despite the core gameplay elements seemingly being lifted from two other franchises, Middle-Earth: Batman’s Creed is still a very fun game to play. I mean, in all fairness, it’s taken two of the best characteristics from the games that it has lifted from…so that’s good, isn’t it? It all connects together beautifully. 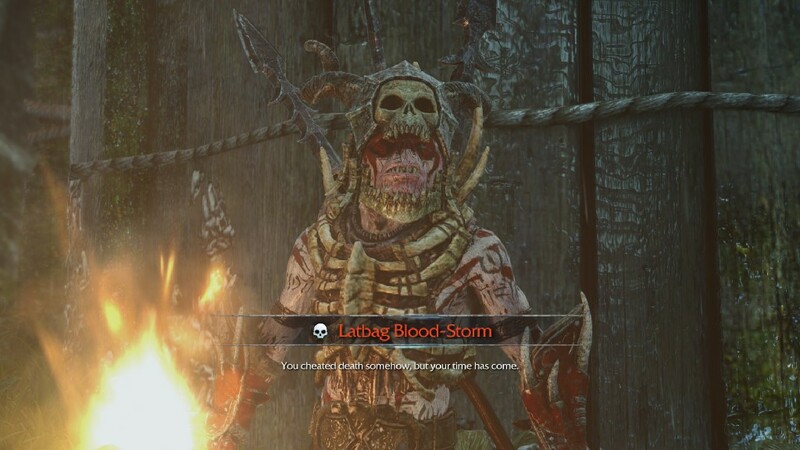 One thing that makes Shadow of Mordor unique, however, is the Nemesis System, which you have probably heard people fanyboying about. 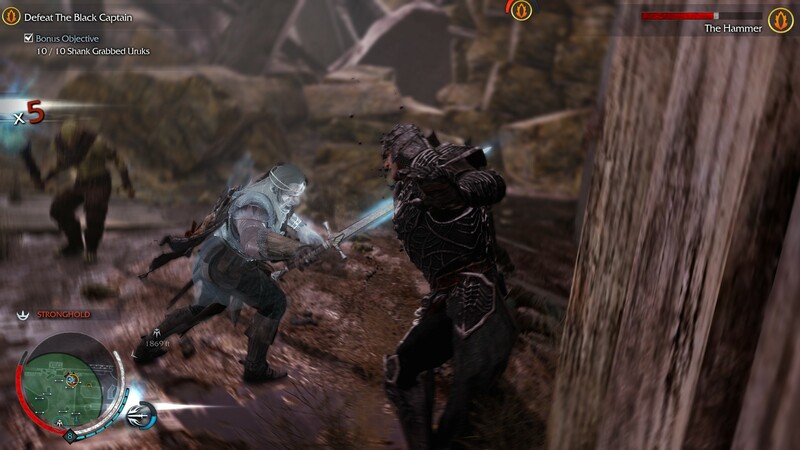 Throughout the story, Talion must hunt down various uruk captains and war chiefs. These are essentially bosses that lead Sauron’s armies. 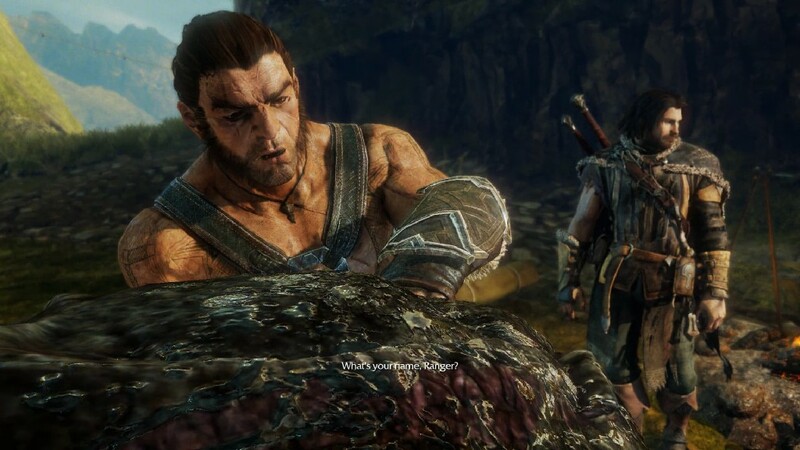 Talion can encounter these commanders throughout the world – which is always quite exciting – and those of whom who have had run ins with him before will remember him – whether they managed to kill you, or if they fled. For example, if you fought Mr Orc before, and you burnt him and he ran, he might appear later on with a burn down his face and say “you went and burnt me an’ now I’m goin’ to kill you!”…or something slightly more creative. It’s a great way to make the world feel alive – and it is extremely satisfying when you hunt down an uruk that killed you previously and slice his head off. 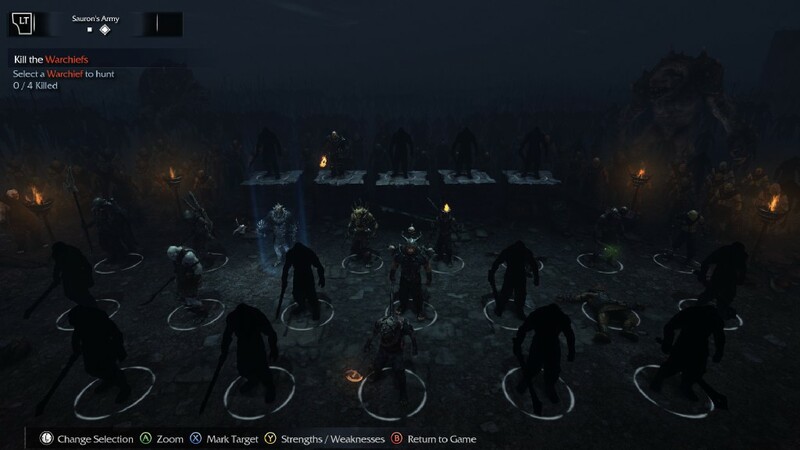 During the course of the game, various uruks will earn promotions, rising up the ranks of Sauron’s forces, and ultimately becoming a lot stronger. They do this by winning fights amongst themselves, recruiting new members or even just having a nice little feast. And, of course, if they kill you. 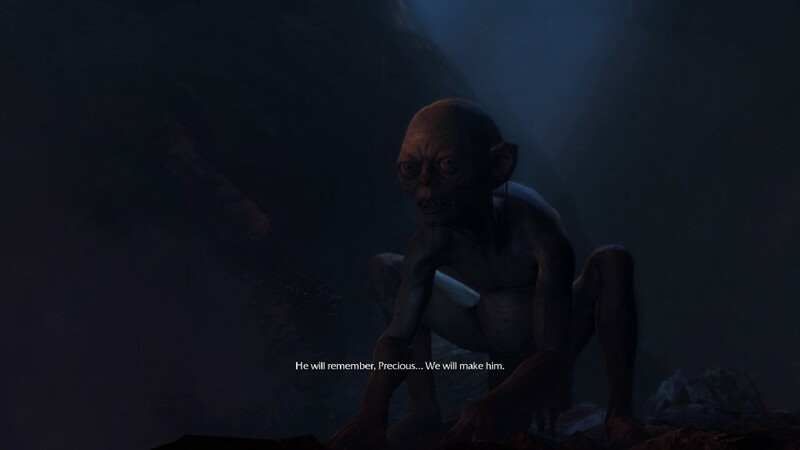 Speaking of, death matters in Shadow of Mordor. Due to Talion’s wraith-like nature, death doesn’t really feel like you have failed. Aside from having to listen to the same dialogue flow whenever you respawn (which seems to reset every time you exit the game), and obviously being withdrawn from whatever you were doing at the time of death, the game progresses as normal, only this time orcs will be like “heeey…I killed you!” One thing I would like to see, though, is death taking its toll on Talion – maybe his clothes could become more damaged, or have scars appear on his body? Something to perhaps symbolise that he’s not really a-ok. Another thing that I would have added would be the ability to have 1 v 1 fights with uruk captains, whilst their supporters looked on. It would make the fights seem a lot more epic and tense, as opposed to you having to go off to deal with another pesky orc every couple of hits on a boss. 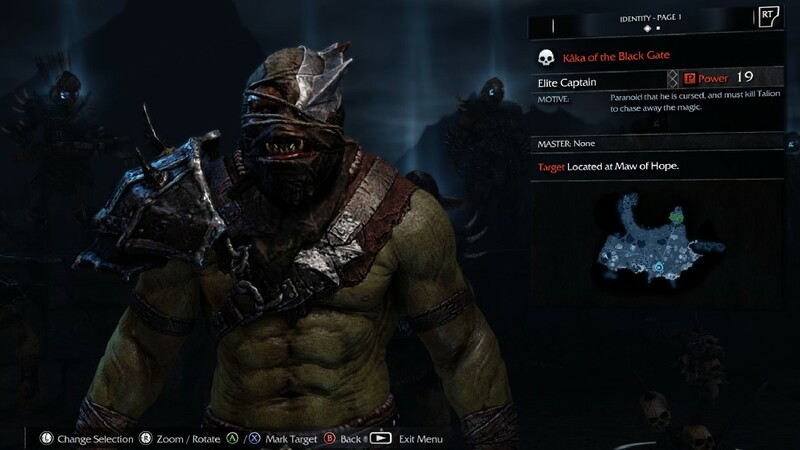 As you unlock more abilities, you can dispatch uruk commanders in a number of different ways, such as sending in one of their minions to do it for. It’s a creative way to enact revenge on those that wronged you, and I hope similar schemes like the Nemesis System can continue to develop and exist in further games. Shadow of Mordor also offers a balrog full of collectibles and side missions to complete whilst you’re avoiding the main story. Artifacts can be found that recall certain memories (somehow) or Middle-Earth’s occupants, revealing histories of the land and its people. There are also sword, bow, dagger, survival and hunting challenges that unlock experience and achievements…but that’s about it; there seems to be no real in game reward, which is a shame. Some side missions include helping a band of soliders known as the Outcasts (which, whenever I see, just reminds me of The Hunchback of Notre Dame song), but these missions are all pretty much the same and tire very quickly. They have, however, also thrown in a nice little sense of community in that if someone on your friends list is killed by an orc captain, you can avenge them in a special ‘vendetta’ mission. 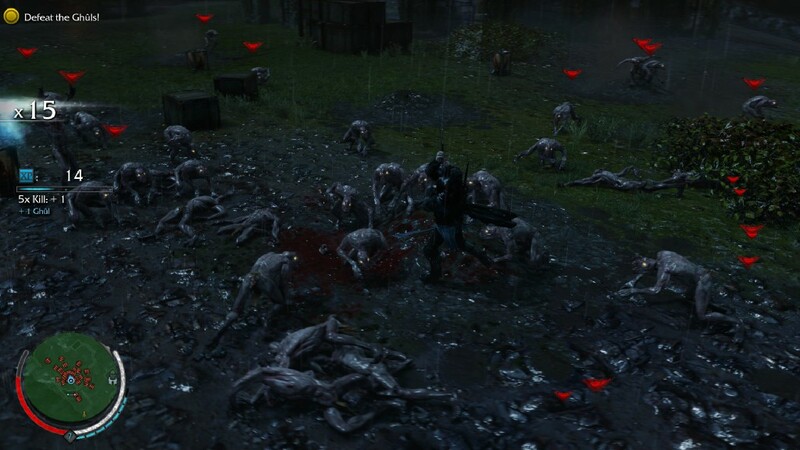 Aside from this, you can also spend all day hunting down various uruks to instil the wrath of Man upon them. The story will probably take you around eleven hours or so to finish, but if you’re a completions and enjoy the side quests, then I reckon you could double that. All in all, I am enjoying my time playing Shordor, but it just doesn’t live up to the hype. I’m not sure if I am missing something, as most reviewers seem to be giving it 9 or 9.5/10. I give it a solid….8. Yeah. It’s a good game, but not without its faults. At the moment, I’m not fussed about buying the season pass (god that’s another can of worms. Bloody season passes). I mean, I don’t mind paying an extra £20 or so if I know the DLC is going to be worth it, or if the game has already provided me with 80+ hours of entertainment like Borderlands…but for this? I’m not sure. I will wait and see what I think of the DLC. I realise I haven’t spoken about the graphics or sound! Goodness me, I’m so sorry. Well, aesthetically this game looks great, especially during the cutscenes, but there isn’t much variety in environment – it’s all Mordor before Sauron spilt his load on it, which looks pretty much the same anyway, just less…ashen. The map also isn’t that big – you start off in one area and eventually progress to a second, but that’s it. Considering the size of the game, these are relativity small. The voices are well acted, however Troy Baker’s Talion sounds like a generic LotR character. If someone said to you “talk in a Lord of the Rings voice”, it would be that voice. Liam O’Brien doing a gosh darn fantastic Andy Serkis impression, and Alastair Duncan portrays a wonderfully slightly dickish elf in the Wraith, which, to be honest, all elves are. Dickish, that is; not wraiths. There is also a database chock-full of lore and character information that will make the most diehard Tolkien fan squee with joy! There are a handful of clipping issues and glitches (such as floating orcs) that I encountered, but nothing game breaking. So go on, get out of here you scamp. Go and play some Shadow of Mordor. Fly, you fools! This entry was posted in Blog and tagged Action, Alastair Duncan, Andy Serkis, Arkham, Assassins Creed, Batman, Batman: Arkham, Behaviour Interactive, Black Gate, DLC, Elf, fantasy, Gollum, Gondor, Hack and Slash, Hobbit, Human, J.R.R Tolkien, Liam O'Brien, Lord of the Rings, Man, Middle Earth, Middle Earth: Shadow of Mordor, Monolith Productions, Mordor, Nemesis System, One Ring, open world, Orc, Ork, Outcasts, PC, Peter Jackson, Ranger, review, Ring, RPG, Saruman, Sauron, Season Pass, Shadow, Shadow of Mordor, Silmarillion, Stealth, Steam, Talion, The Dark Lord, The Hobbit, The Lord of the Rings, Tolkien, Troy Baker, Uruk, Warner Bros. Interactive Entertainment, Wraith.